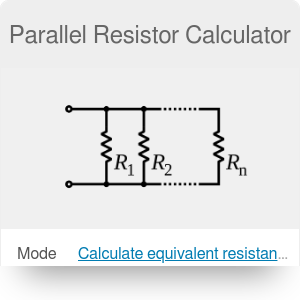 The parallel resistor calculator is a tool for determining the equivalent resistance of a circuit with up to five resistors in parallel. Read on or jump to the series resistor calculator. R1, R2, ... Rn are the resistances of individual resistors numbered 1...n.
The units of all values are Ohms (symbol: Ω). 1 Ohm is defined as electrical resistance between two points that, when applied with a potential difference of 1 volt, produces a current of 1 ampere. Hence, 1Ω = 1V / 1A or, in SI base units, Ω = kg * m^2 / (s^3 * A^2). Establish the values of resistance for all resistors connected in parallel. For example, you can use three resistors of 4Ω, 3Ω and 6Ω respectively. Input these values in our parallel resistor calculator. Read the result. In this example, 1/R = 1/4 + 1/3 +1/6, hence 1/R = 0.75 and R = 1.33 Ω. The principle is the same as when determining capacitance in series or induction in parallel - you can use it for these calculations, too. Just remember that units are not the same! If you would like to find out the value of power dissipated in the resistor, try the Ohm's law calculator. Parallel Resistor Calculator can be embedded on your website to enrich the content you wrote and make it easier for your visitors to understand your message.